Choose this Martinsville, Indiana hotel located near Indiana University at Bloomington, Indianapolis and Bloomington. Welcome to the Best Western Martinsville Inn located near State Road 37 in Martinsville, Indiana. Guests will find a friendly staff and clean accommodations at an affordable rate. 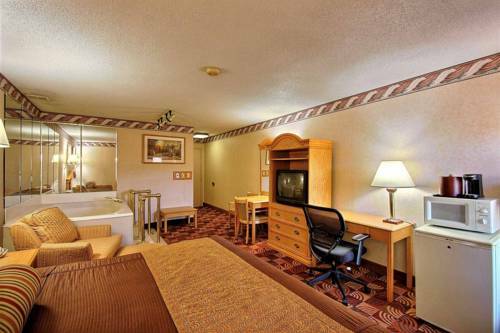 This hotel is close to Indiana State University, Purdue University and Indiana University. The Best Western Martinsville Inn features 48 spaciously-appointed guest rooms with cable satellite television with HBO and high-speed internet access. Guests will wake each morning to a complimentary full breakfast. This Martinsville hotel offers additional amenities including free parking, a fitness center and business services. Pets are welcome. This Indiana hotel is close to many area attractions including the Bloomington Convention Center, the Bloomington Racetrack, the Paragon Speedway, the Indianapolis Zoo and the Lucas Oil Stadium. Business travelers will be minutes from the For Bare Feet Company, the Otis Elevator Company and the Eli Lily Company. Guests will also find nearby restaurants and shopping. For superior customer service and a convenient location in between Indianapolis and Bloomington, make a reservation at this Martinsville hotel today! Gym - Exercise facility 24 Hour treadmill, elliptical, stationary bicycle are five years old. Two person weight system and Promaxima multi-gym installed. From: The north. Take State Road 37 south to Martinsville from Indianapolis. Exit Ohio Street, make a right. From: The south. Take State Road 37 north to Martinsville from Bloomington. Exit Ohio Street, Take 1st left onto Bills Boulevard. 50 Bills Boulevard is on the right. From: Indianapolis Airport Go west on I70. Take the IN39 exit, exit 59 toward Monrovia. Keep left to take ramp toward Monrovia. Turn left onto IN39/County HWY 200S/SR 39. Continue to follow IN 39. Turn right onto W Main St/IN42/IN39. Take 1st left onto S Chesnut St/IN39. Continue to follow IN 39. Turn right on SR 67/IN39. Turn left onto SR 39. Turn right onto Morton Ave/IN39. Turn left onto Burton Ln. Take 2nd left onto Duo Dr. Turn right onto Orange St. Take 1st left onto Bills Boulevard. 50 Bills Boulevard in on the left.